It all started with waste tyres of a Prototype Alfa 33 Sport, at the Alfa Romeo test track in Balocco, Piedmont. 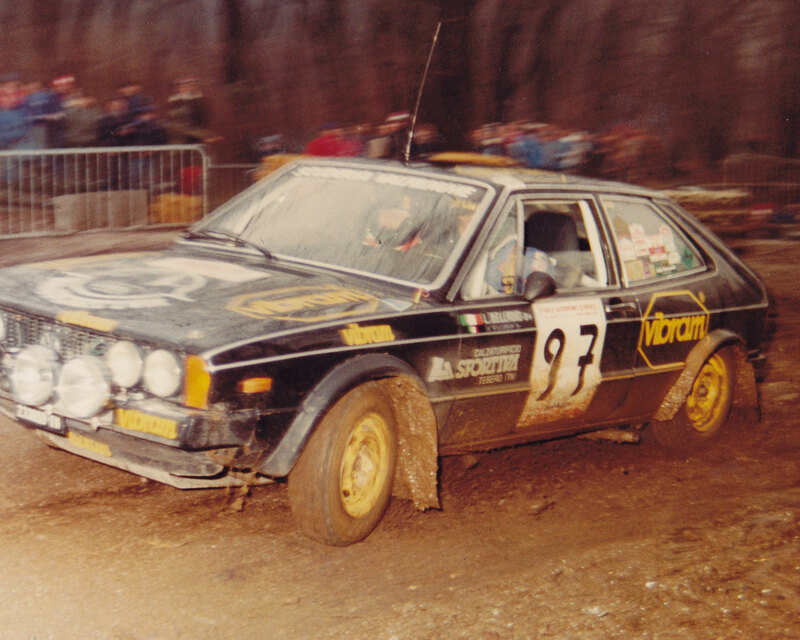 had been in touch with Alfa Romeo on account of my passion for rally and motor racing competitions and heard that there was a deposit at the Balocco test track where slick tyres no longer used for races or trials were piled up. The tyres were the ones used by the Alfa 33 Sport cars, which competed in the prototype world championships and the American Can Am championships. So I had the idea of contacting this person I knew at Alfa Romeo to ask if I could have some of those used tyres, to see if the compound of the treads could be used as the sole of our climbing shoes. The idea was to improve the grip of the soles using the compound of the competition slick tyres. 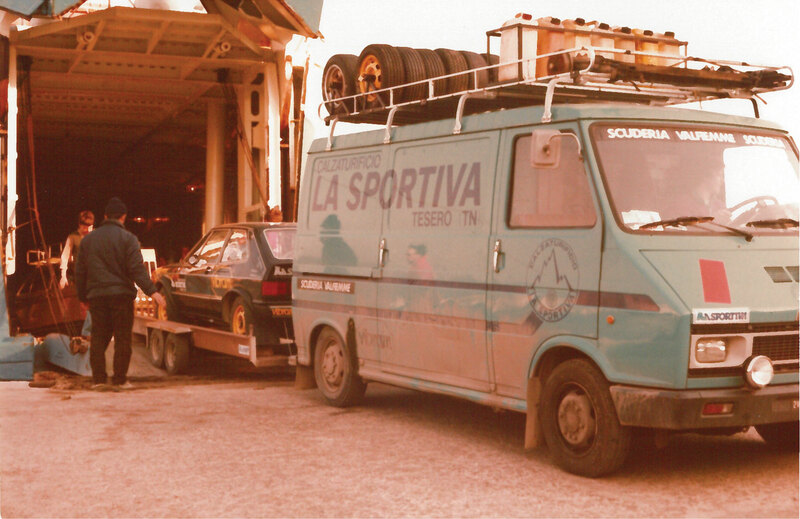 They said ok, I could go and pick up the tyres at Balocco and after talking to my father Francesco first, I set off one morning from Tesero to the circuit. I still remember a very long journey in our blue Fiat 242 van, taking ove six hours, the roads back then weren’t like those of today. I meet the person in charge and they let me into the circuit. I fill our van up with as many tyres as I can, maybe twenty. The trip back was better and seemed shorter, a tape of the Rolling Stones was playing and from one loudspeaker the raucous voice of Mick Jagger is belting out. I can’t wait to get back to Tesero and start working. I realise that I have something absolutely innovative with me, something which can help us create a revolutionary product. The first problem which presented itself when we tried to work on the rubber in the labs and take off the tread, was that there were strengthening metal cables inside the carcasses which we had to patiently eliminate, being careful not to ruin the compound. It was a lot of work. We had to cut each tyre and carve it out bit by bit eliminating the sidewall first, cutting out the metal cables and then we cut out the soles with what was left of the tread. We spent a lot of time doing this job, but the soles that we managed to get out were the best we’d ever had. By a long way, the best. We fine-tuned a method which didn’t waste too much time on the recovery job, preparing hollow cutters which were needed to cut out the soles from the tread with shears, in such a way that they could then be glued under our athletes’ shoes. It is clear that such a complex procedure could only be justified for our top climbers, to create a type of product that had never been made before. The problem we kept encountering using racing tyre treads was that to reach its maximum efficiency and the best friction, the compound had to reach a certain, optimal temperature and therefore had to be heated. For cars, bringing the tyre to the right temperature is not a problem, since it is the speed around bends and the rolling, the friction of the tyre advancing that causes the compound to heat up. For rock climbing the story becomes a little more complicated, we are talking about the slowest sport in the world. In climbing you cannot ask the rubber to work in conditions of dynamic friction, but rather to work in conditions of static friction, and we realised straight away that the problems linked to friction in the sport of motor racing were radically different from those of climbing. For this reason, for the impossibility of bringing the tyres to the right temperature, it was impossible to reach the maximum level of efficiency of the soles without a warning to keep them exposed to the sun for some time before using them. You need to take care to keep the soles clean and not greasy and, before climbing, rub the surface of the soles with your hands until it becomes boiling hot when you touch them, at that point the compound is so high-performing and soft that the soles can even be stuck together. This is the sign that the compound has reached the right temperature for the exercise. Once they were nicely warmed up, the soles gave exceptional performances, of another level compared to the soles of climbing shoes which already existed in those days, at least until the moment in which, after a few minutes, the soles went back to the temperature of the surrounding environment. At that stage of our development we had found the right solutions for the leather uppers, which we combined together with a cotton liner and then we could perfectly model them around the shape of the foot. Nobody up to that moment had put together the two most important things in a climbing shoe: upper and sole. Boreal had an exceptional sole, but it produced a shoe in unlined leather which, from a climber’s point of view, was quite uncomfortable and painful, and in time lost its original shape and tended to widen and stretch quite quickly. On the contrary, the French EB shoes which were a lot more precise in their fit and in the way the side edge worked, compared to the Boreal shoes, were made of cotton fabric and were very painful. The Sorrento leather together with the cotton fabric allowed our shoe to be comfier, to be always precise around the foot and to keep its shape over time, even after an intense period of use. The fact that the shoes became deformed and yielded around the shape of the foot had become, thanks to the match with the fabric, no longer a flaw but a quality in the product. After using the shoe for a while and breaking it in, anyone could have a shoe made to measure. We had achieved an extremely important step and, thinking back, that is what represents, still to this day, our industrial credo, what drives us to innovation and every decision taken to develop our products: transforming a limit into an opportunity. Another innovation was the rubber edge of the shoe which had evolved with the passing of time and the prototypes and it was no longer the same one used on the very first models, it had become narrower and more wrap-around, smooth instead of coarse and it affected the performance when leaning or smearing the rock shoe. In addition, it was useful for the elastic tension on the heel which pushed the foot forward and kept it still. This was an important transition towards light-weight shoes with a liner designed specifically for rock climbing. Up to a few years before, climbing shoes continued to be considered as an evolution or derived from mountain boots and they were not considered as a true and proper item of sports equipment crucial if you wanted to increase the technical level and overcome climbing difficulties. By developing and testing prototypes, we had understood this. Some people still thought of climbing shoes for a possible use during some phases of alpine ascents, some imagined an internal liner of double boots to be trusted only to overcome technical sections of climbing on rock during an ascent on big rock faces. At that time, climbing at the bottom of the valley on crags still didn’t exist. Up until a short time before, the function of a climbing shoe was to protect and support the foot when leaning on the foothold and to achieve this every project had to offer a tough shoe with a rigid midsole. For a while, we also tried to insert a wooden sole of ashwood into the Ghedina climbing shoe to stiffen it, then successively moved on to metal in the Brenta model. For the first trials with metal midsoles, we cut the shapes with shears starting with the blade of the circular saws used in sawmills, we were looking for a type of resistant steel, which was at the same time flexible, and the bandsaws were just what we needed. At that time a climbing shoe, above all had to last and be versatile, comfortable in all conditions and on every type of terrain. The typical sole was in sculpted rubber and the producers then were Pirelli and Vibram. The climbing shoes of the 70s had to be tough and multifunctional and also maintain some of the characteristics and quality of climbing boots, to also tackle unexpected conditions and situations typical of high altitude. Up until then, apart from Yosemite which represented a world apart, climbing meant going up into the mountains, not staying down below. Traditionally the climbing boot was worn from the beginning of the ascent and not taken off untill the end of the day. Almost without noticing, we had gradually started to ask the shoemakers to make something different and new compared to what we had requested previously: above all we wanted high performing shoes. The shoes had to be light, precise and have more grip, they had to allow for rock climbing using modern techniques, on more difficult grades at the cost of sacrificing some of the shoe’s durability or to have to put them in your back pack for the approach walk. Almost without realising it, we were entering a different era, passing from the production of mountain boots or alpinism boots to climbing shoes. Alpinism and alpinists were also living a moment of epoch-making change: alpinism and high difficulty climbing were growing apart. They were now two separate worlds and this meant a whole new market to be explored. It was a fantastic opportunity and at that point we had almost all that was required to be protagonists in this change. The climbers we were working with and setting up the making of our shoes with asked us for certain changes and pointed out the road to follow with our products. Among our first consultants were Bepi De Francesch and Gino Comelli with an intuition regarding the transition from a rigid boot to flexible shoes with a smooth sole. Having overcome that taboo and that phase, Alberto Campanile and Aldo Leviti were our points of reference for the development of the smooth sole prototypes. Then we continued with Manolo and Heinz Mariacher for the definitive jump into the world of free-climbing and very high difficulties in that magic moment when grades were constantly increaing and sport climbing was taking shape. From the beginning of the 80s, climbing and alpinism had become two distinctly separate activities: one was about exploration and the unknown and therefore had a great quantity of variables, including the environment to consider and the other had only one final aim, to overcome maximum technical difficulties. In those years the Welzenbach scale of mountaineering difficulties was established too, and VII, VIII and IX grades were born. At any rate, since my grandfather Narciso’s time, we at La Sportiva proceeded with the development of our products with the same system: we listen to the indications of experts, of the more visionary alpinists and searched for constructive solutions and materials to make increasingly better shoes. 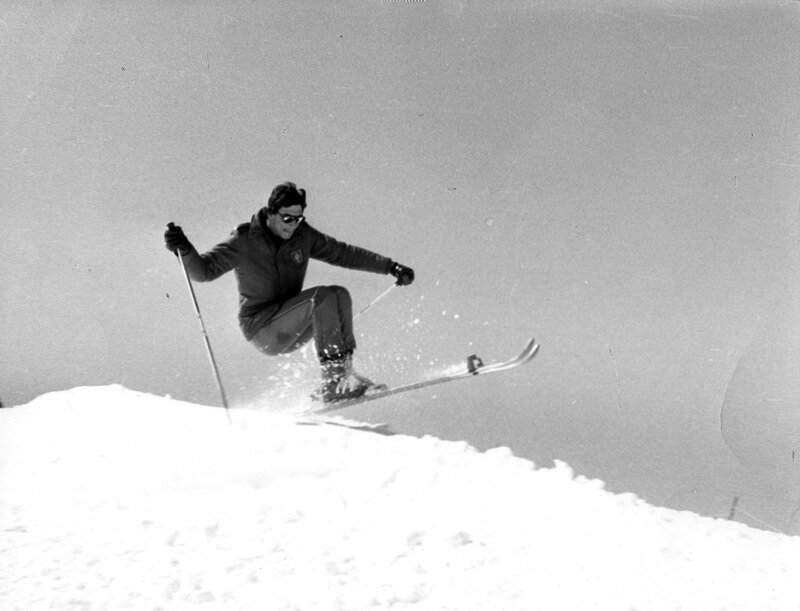 This way, following this philosophy, innovative solutions were found, like the back-lacing of the Super Winkler, an idea borrowed from ski boots and invented to give more stability to the feet and a push towards the front portion of the shoe. Or else, more recently, the innovation of the No-Edge shoes, made with no edge between the sole and the lateral section of the shoe, to favour a more modern and instinctive style of climbing. The evolution of a product is always a question of intuition, sensitivity and perception of the athletes and at the same time working on this development within the company. It is team work. With the continuous hand-made re-elaboration of the prototypes, with the gathering of feedback and the start of the process of setting up a work method: it always has to be the same from beginning to end. It is also for this reason that the La Sportiva shoe factory has this name: because from the beginning, from the origins of our history, we do not produce generic mountain boots, but footwear that aims at offering the possibility to obtain the best possible performance for whoever wears them. With soles obtained from racing tyres–even if this was a costly and difficult process - we had found the best solution for our shoes, at least for our top athletes, but it was clear that we had to find a definitive solution even for soles which were going to be sold commercially and if possible improve the technical characteristics of the rubber. 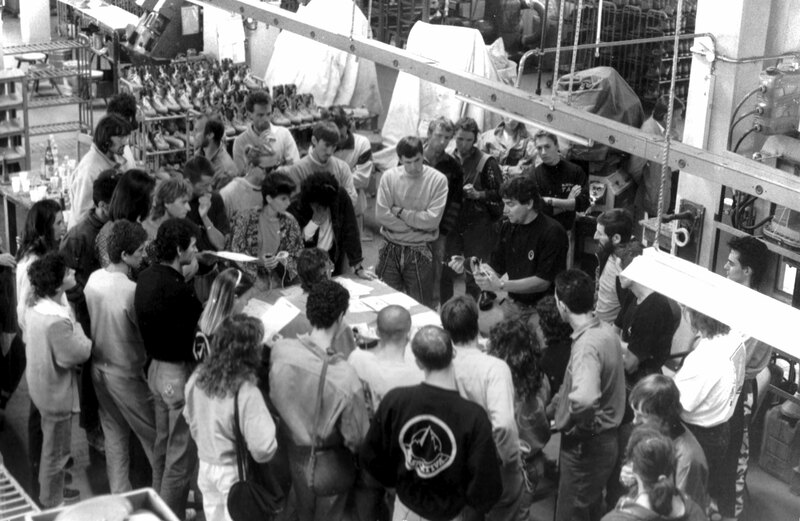 At the same time, as well as us, other companies were working on developing and evolving climbing shoes, it was a moment of great excitement. For the French who had been climbing for some time on the boulders of Fontainebleau it had been clear many years earlier that to progress technically in climbing you had to rely on the precision of the shoes and the friction of the soles, more than the midsole’s rigidity. Fontainebleau’s boulderers did not know what to do with sturdiness and rigidity. This matter was even being discussed in the Dolomites at the Police Alpine training centre in Moena: I had done my military service there. During the time spent doing my military service, I had dealt with two schools of thought as far as climbing on high difficulties was concerned. On the one side you had the instructors Emiliano Vuerich and Bepi De Francesch, who had collaborated with La Sportiva for a long time, both were expert climbers and had a classic climbing background. They believed that shoes had to be precise and with a rigid sole, to lean with precision on the small footholds of the limestone routes of the Dolomites and to be safe and reliable in any condition, even in case of bad weather and on wet terrain. 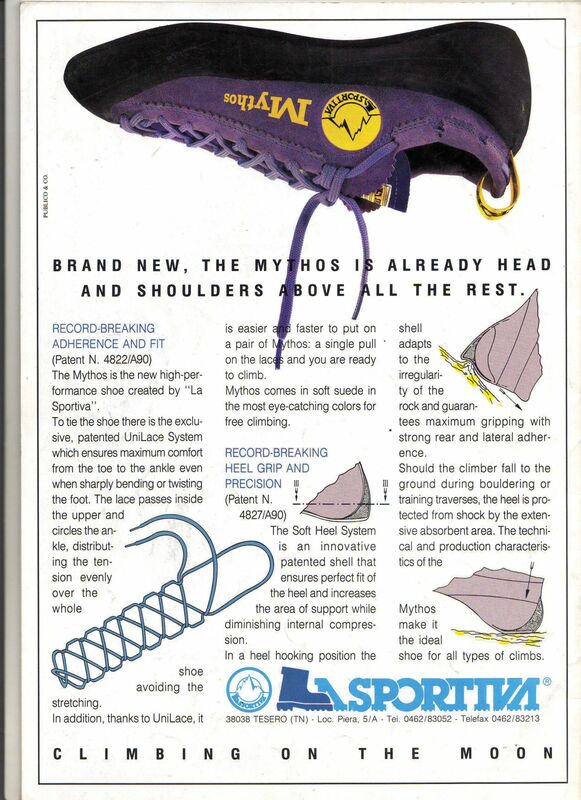 On the other hand there were younger instructors like Comelli who asked for a soft and flexible shoe with a smooth sole, conceived uniquely for climbing on rock. In those days in Italy, and more generally in the Alps, only the climbers from Trieste climbing in the Julian Alps imitating Emilio Comici, had the habit of using shoes with smooth soles for climbing on limestone and Comelli came from that area. In other areas, almost everywhere else in the Alps, from the Dolomites to Mont Blanc, shoes were required to go well from the approach walk to walking on snow to then move on to climbing on the rock, on technical and vertical terrain. The only Italian exceptions were Val di Mello and Valle dell’Orco, the areas of the ‘Nuovo Mattino’, where free-climbing was on granite and on the rock walls at the bottom of the valley, without necessarily having to reach the summit. In these areas the technique and gear used in the Yosemite Valley found fertile terrain, including soft shoes. Lacking a better sole and in substitution of the original rubber, for climbing at the bottom of the valley, Aerlite soles were glued under the soles of canvas Superga tennis shoes, this material was used at the time for resoling clogs. The handmade solutions which were thought up and experimented in Valle di Mello and Valle dell’Orco first of all anticipated and then imitated the Boreal shoe, which would have quickly become the benchmark shoe of the Yosemite Valley and a whole generation of climbers. At least until we arrived with our Mariacher climbing shoe. What we had realised was that our shoe combined with Spanish rubber made a leap forward in terms of quality and it was clearly more precise and performing than Boreal, especially on limestone. It was evident that we had to find a definitive solution for the soles of our climbing shoes. 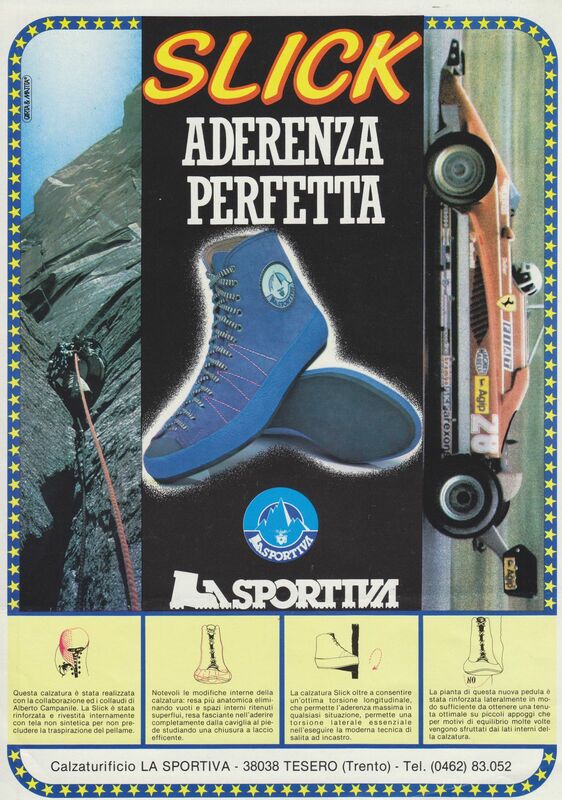 The idea of testing Boreal soles on La Sportiva shoes came to Manolo and he managed to find himself a pair of these shoes which in those days were still not on sale in Italy. He and a few others among our athletes had tested our shoes in both versions, both with the soles which came from the slick treads of racing pneumatics, and those from Boreal and the Spanish compound. The feedback we got was that we had to find and use that type of sole and that way our climbing shoe would become the best ever. The soles which came from the racing tyres tread was an experimental and transitory solution which had helped us understand that to improve our shoes and therefore our project progress, it was fundamental to find a supplier. Thanks again to my car racing experience, I had come in contact with a technical expert at Rovereto from Marangoni which is a firm from our region which still produces pneumatics for cars and lorries today. During rallies I used their vulcanised covered tyres which went perfectly well on snow and dirt surfaces. Marangoni had a production technology which allowed it to build the pneumatic more than once, applying the tread on to the carcass thanks to a process of vulcanisation. It was a procedure which lay half way between industrial and artisanal, even quite cheap, and it allowed to personalize the pneumatics in the design of the tread and in the compound which could be chosen each time depending on the conditions of the terrain and the race. 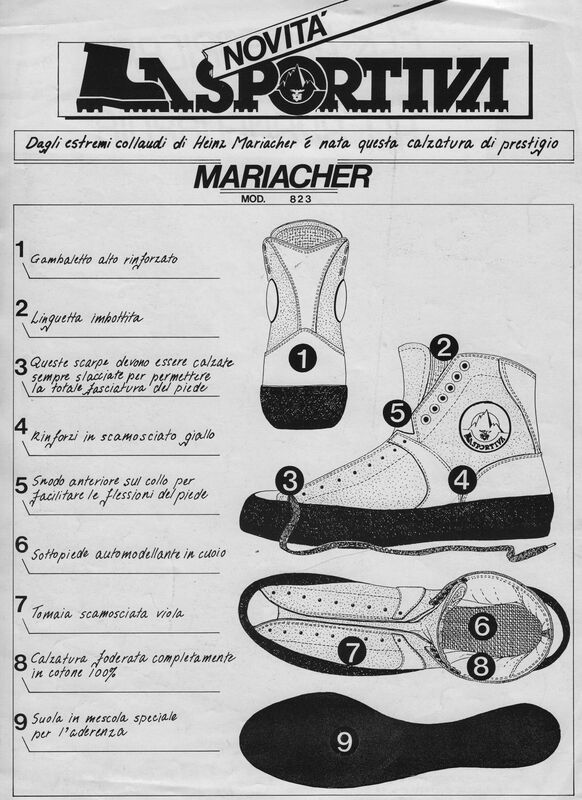 They never experienced at Marangoni and had the necessary know-how to work on the compounds for our soles. I had managed to meet one of their directors and explain our technical needs to him and the problems we had with the slick tyres we had worked with. At that point, our prototypes with the Spanish compound which we achieved using the Boreal soles had proved to work perfectly and had to be industrialised. Excluding the option of buying the soles from Boreal which represented our direct competitor, we were above all looking for a business partner with whom to collaborate to develop the compound and produce the rubber needed for the soles of our shoes, which we aimed to sell in great quantities. We not only did we need a supplier, but also a technological partner more than anything else. Someone with whom to develop a material that was not yet available in Italy. Successively Vibram would have arrived, but in those days it still had not entered this sector. Marangoni welcomed my request and made available, who took over the project and made the task his personal challenge. He was a highly motivated person, truly passionate about his job. They undertook the necessary studying and research, after a few attempts and some time they came back with some samples of rubber to try. They fine-tuned a series of rubber with different compounds to test up until, after many attempts which went nowhere, we managed to synthesise and develop a rubber which had a level of performance and duration equal to the Spanish rubber. Bingo! The parameters on which the Marangoni formula chemist worked were three: the compound’s ingredients, temperature and pressure. The recipe, the composition of the rubber and the working method of the rubber was their business, we dealt with the shoe and we had collaborated during the tests of the compound involving our climbers, who were enthusiastic about the results. The soles were really good and our shoes all in all worked a lot better than our competitor’s. We only had one problem with pressing the rubber into sheets: sometimes some air remained trapped in the compound and consequently in the soles. The compound could have air bubbles trapped inside when it was spread out onto sheets, pressed and chilled. Sometimes the soles could show these imperfections during the cutting or the carding or successively by being used, which interfered with the quality and performance of the product. As well as being an aesthetic problem, it was a problem of quality and duration. We found a solution and once again it was the technical expert at Marangoni who had the intuition to lay out inside a series of cotton threads the mould where the compound was poured into, which had the function of sucking out and guiding the air contained inside the mixture towards the exterior, that way thanks to those microscopic cotton threads, the soles no longer had the flaw of air bubbles. Even the problem of the irregular wearing out after using the sole had been solved. Looking at the sole of the shoe in those days it was possible to see the presence of those cotton filaments which had an extremely important function and which probably represented an unintelligible dilemma for whoever asked themselves where our soles and our technology came from. Once my father Francesco and I had developed the product, we were enthusiastic. We signed the deal with Marangoni, who promised to keep the secret of our rubber formula and to produce it exclusively for us. I would personally go to their factory with the van and would bring home the sheets of rubber needed for our soles, which were bought according to their weight. I would enter their factory with the usual blue Fiat 242 van and would go to the weigh station empty, they would load two pallets of rubber in sheets for the soles of our shoes, we would weigh the van for the total count of the goods, they would then give me the delivery note and the travel documents. Nobody could know that the Spanish rubber in reality came from the Marangoni factory at Rovereto. Therefore I had to be very careful in keeping the travel documents and not showing anyone the heading ‘Marangoni’ on the documents. An accountancy employer - only one, Carla always the same - looked after the Marangoni bills and receipts and paid the supplies without letting anyone else know. It was an industrial secret. Apart from my father and I, Carla was the only person to know the true origin of the soles of our climbing shoes. Without explaining anything to anyone, we would tell our employers, our agents and clients that what we were putting onto our shoes was a Spanish compound. It was true. In their imagination they probably believed that the Spanish compound came from Spain, we didn’t have to tell them where the rubber was produced, exactly. It was a secret which in turn we had to defend and protect from the competition and for many years this was an advantage, which the three of us jealously kept secret: myself, my father Francesco and our employee. Nobody knew that our Spanish rubber was made in Rovereto.